What is Remanufacture? Remanufacture should never be confused with refurbishment or reconditioning. It is a process which involves the complete rebuilding of a machine using brand new parts to return it to an 'as new' condition. The Process The entire process is of high standard and quality each remanufactured machine undergoes rigorous performance and safety tests before being returned to service. 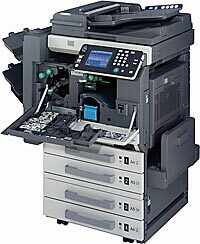 Every copier returned from a customer is matched with its own service and repair history. But, before it is accepted for remanufacture, it will be given a thorough check before being allocated to a skilled specialist engineer who strips the machine down to its chassis. The engineer then rebuilds his machine by hand to its original manufacturer specifications using brand new parts. Any updated technical specifications and software are automatically incorporated - including any new instructions and safety labels.